This page last updated June 10th 2008 - updates for the Faur built 6LDA28 powered locomotives. For what its worth this is my attempt at trying to produce a list, by country, of diesel locomotives and railcars powered by Sulzer engines. These engines were built over a period of at least sixty years and powered trains all over the world. Some have been well documented and examples have reached preservation whilst other worked out their years in the less well travelled parts of the world, then disappeared into oblivion. The list is compiled from many sources of information. An illustrated booklet produced by Sulzer Brothers in 1967 featuring their traction engine production from 1911 - 1967 was most useful. Information from that booklet and other sources is incorporated in these pages. Without a doubt there are many minor 'errors' on this page, which may simply be variances in records relating to, for instance, ordering dates versus delivery dates or modification of factory rated horsepower to local ratings dictated by altitude or high temperature climates. Large orders for power units frequently included spare engines as part of the contract. For many of the entries further detailed information can be found on a particular country's Sulzer powered locomotives by clicking on the link at the bottom of each country table. Algerian Railways (CFA) - railcar Sulzer 2 x 6LTD19 300hp each De Dietrich & CIE, Reichshoffen Works 1939, Bo-Bo, metre gauge. ?? 1 ?? Algerian Railways (CFA) - fourgon 2 x 6LDA25 850/665hp De Dietrich & CIE, Reichshoffen Works 1950/51, A1A-A1A, 4ft 8.5in Alsthom 5 ?? Argentina State Railway Armstrong Sulzer 6LF19 300hp railcar BRCW, Smethwick 1937, Bo-2, 5ft 6in two mechanical, two hydraulic mechanical 4 #?? Argentina State Railway Armstrong Sulzer 2 x 6LF19 600hp total articulated railcar BRCW, Smethwick 1937, ? ?, 5ft 6in mechanical 2 #?? Ferrocaril Oeste Sulzer 8LV25 450hp (rail-motor) Armstrong Whitworth 1934 ?? 1 ?? Port of Rosario Sulzer 6LV25 330hp Henschel 1931, Bo-Bo, 5ft 6in Oerlikon 3 ?? Argentine State Railways 4 x 6LDA25 735hp each Argentine State Railways 1951, Do-Do + Do-Do, 5ft 6in Oerlikon 2 ?? **1949 loco: ordered as No.20, delivered as No.22 but carries small plate on frame No.20. **1956 loco: ordered as No.23, delivered as No.24 but carries small plate on frame No.22. **Similar to the Roumanian CFR 060 DA Co-Co's. Weight 115 tons, Length 17 metres, Maximum Speed 100km/h. Weight 52 tons, Maximum Speed 43.5mph. Used on the 212 mile line south from Douala. Ceylon Government Railways Sulzer 880hp - no further details Armstrong Whitworth c1933 ?? 2 ?? Used for service on the 'Indian Mail', not a success, soon exported to Argentina. ?? 6LDA28B 1250hp Faur 1971, Bo-Bo Voith (Hydraulic) 2 ?? Cuban National Railways 6LDA22-C 740hp Brissonneau & Lotz, Creil, France 1954, Bo-Bo, 4ft 8.5in Brissonneau & Lotz, Nantes, France 6 Occidentales 7501-7506, then Occ/FCC 8009-8014, then FCC 60800 series. ?? 6LDA28 1250hp Faur 1972 - 1983, Bo-Bo Voith (Hydraulic) 42 ? France - sorted by company in no particular order. Houilleres du Bassin de la Loire 6LDA22 600p Cie des Forges et Acieries de la Marine et d'Homecourt 1950, 0-6-0 CEM 1 ?? USINOR, Denain 6LDA22 570hp ?? - 1952, 0-6-0 CCM 3 ?? Electricite de France 6LDA22 600hp C.A.F.L. (formerly Homecourt) 1954, 0-6-0 CEM 1 Nantes-Chevire power station, Loire-Atlantique. CAFL, Paris 6LDA19 420hp CAFL 1958, Bo-Bo CEM 1 ?? Marine Homecourt 6LDA19 420hp Marine Homecourt 1958, Bo-Bo ?? 1 ?? All are standard gauge 4ft 8.5in. (1) Retired by 1971, 60032 preserved at museum in Mulhouse. Henschel & Son gmbh 6LDA22 360hp Henschel, Kassel 1955, 0-6-0, 4ft 8.5in Hydraulic 1 ?? ?? 6LDSR28B 1250hp Faur 1979 - 1982, Bo-Bo ?? 10 ? ?? 6LDA28B 1250hp Faur 1984, Bo-Bo Voith (Hydraulic) 3 ? Japan National Railways 6LDA22 750hp Mitsubishi Heavy Industries 1954, Bo-Bo, 3ft 6in hydraulic 1 # ?? (1) Five ordered prior to WWII, (three delivered 1943/44, two in 1946) & seven in 1952. All Bo-Bo-Bo wheel arrangement, Weight 62 tons - first five, 66 tons - last five. South Manchuria Railway 6LV22 250hp railcar South Manchuria Rly/SIG 1931, 2-Bo, 4ft 8.5in ?? 2 ? South Manchuria Railway 6LTD25 500hp railcar South Manchuria Rly 1935, 2-Bo, 4ft 8.5in ?? four car articulated set, total 4 (seating 286) ? (1) Initially delivered to the PLM France in 1933 and transferred to CDF Mediterranee-Niger in 1946. (2) Initially delivered to the CF de Grande Ceinture France in 1933 and transferred to CDF Mediterranee-Niger in 1946. CFM 6LDA28B 1250hp Faur 1980 - 1981, Bo-Bo Voith (Hydraulic) 32 ? (1) 1425 - 1428 were transferred to Nyasaland Railways (Malawi), reporting numbers unchanged; Purchased to replace the four locomotives transferred to Nyasaland Railways. The Central African Federation established 1953 comprised Rhodesia, Zambia & Nyasaland. It was dissolved in the 1960's with Nyasaland gaining independence in July 1964, changing its name to Malawi. See notes on Nigeria Railways that reflect the transfer of four new Station Class machines (1425 - 1428) to Nyasaland Railways. (1) Became Malawi Railways 400 - 404 in 1967. The last two machines cost GBP85,000 each. (2) & (3) Became assets of Trans-Zambesian Railways, numbers unchanged. CFM (Mocambique) took over the line from Beira to the Malawi border in 1967, including 205 - 214. Peruvian State Railways 6LDA22E 510hp Mitsubishi Kobe 1962, Bo-Bo, 3ft 0in ?? 2 ?? ?? 6LDA28B 1250hp Faur 1977, Bo-Bo Voith (Hydraulic) 3 ?? (1) Known as the 'Thermo-Lokomotive', powered by a direct reversing two stroke valveless engine, direct drive through coupling rods. Trials halted by World War I, locomotive was not a success. First application of a Sulzer engine for rail traction. (2) Two re-purchased by Sulzer, rebuilt and resold to Val De Travers railway 1923, to become BCm8 & BCm9. CFR = Caile Ferate Romine. (A)All 060-DA locomotives are Co-Co wheel arrangement, 1,407 were built. (B)All 040-DF locomotives are Bo-Bo wheel arrangement, 28 were built. (C)All 040-DHC locomotives are B-B wheel arrangement, 633 were built. (1) 1st application for this power unit, see also PLM, France. Retired 1964. (2)The first six locomotives were built in Switzerland (carry SLM & Brown Boveri worksplates). (3)Similar to the earlier class 60 but with higher maximum speed, 120km/h versus 100km/h. (5)Built for the Oravita - Anina line. (6)Similar to the Class 69, but equipped with two air compressors. (7)Equipped with steam heating generator. (9)Delivered to a variety of Roumanian industrial users. (10)Delivered to a variety of Roumanian industrial users. With thanks to Romain Viellard for most of the Roumanian information. Chemins de Fer du Senegal 6LDA25 720hp AFL, St Chamond, France 1954, Bo-Bo, 3ft 3.3in(1000mm) Voith (hydraulic transmission) 8 BB221 - BB228? Sulzer Brothers, Winterthur 6LD22 350hp Krupp 1954, 0-6-0, 4ft 8.5in ?? 1 #?? (1) One preserved in Zurich museum. Originally for Prussia & Saxony, two repurchased by Sulzer and rebuilt. (2) Two prototype railcars for the Fleches Rouges (Red Arrow) service. (3) Class BM 4/4 II Wheel Arrangement Bo-Bo, weight 65 tons. 18451 is preserved. (1) Originally acquired in 1938 by a phosphate mining company near Tebessa, Algeria. Obtained by the CFT in 1945/46 for operation in the Tunis area. Armstrong Whitworth/LNER 8LD28 800hp Armstrong Sulzer Armstrong Whitworth, Newcastle 1933, 1Co1, 4ft 8.5in Laurence Scott & Electromotors, Cropmton Parkinson, Allen West 1 ? Armstrong - Shell Express, LMSR, LNER & ?? 6LV22 250hp Armstrong Sulzer Armstrong Whitworth, Newcastle 1932, 2-Bo, 4ft 8.5in GEC 3 'Northumbrian' - whilst on LNER, others ?? (1)Later Class 24 (24001-24150). All withdrawn by 1981. Three preserved. (2)Later Class 25 (25001-25327). All withdrawn by April 1987. Twenty preserved. (3)Later Class 26 (26001-26046). All withdrawn. Several preserved. (4)Later Class 27 (27001-27066, 27101-27119, 27201-27212)-several renumberings. All withdrawn. several preserved. (5)Later Class 33 (33001-33065, 33101-33119, 33201-33212). A couple still active (Feb 2001). Several preserved. (6)Later Class 44 (44001-44010). All withdrawn. Two preserved. (8)Later Class 46 (46001-46056). All withdrawn by November 1984. Three preserved. (9)Removed from service late 1963 and dismantled soon after. Power unit taken back by Sulzer. (10)Later Class 47 (47001-47999, many renumberings, many gaps). Some still active (Jan 2002). Several preserved. (12)Exported to Russia, July 1971. Fate uncertain. Sulzer's most powerful power unit for rail traction. (13)Still operational as late as August 1960. (1) This engine has absolutely nothing to do with Sulzer engine development for rail traction. It is included here simply because it carried the Busch/Sulzer name, all development was from Busch. In general the larger Sulzer engines did not meet the expectations of the North American market with the AT&SF & UP quick to sideline these locomotives as problems began to occur. ?? 6LDA28B 1250hp Faur 1991, Bo-Bo Voith (Hydraulic) 1 ?? Prussia & Saxony Prussian Railways, 4LV38 1,000hp, one - 'Thermolokomotive'. Prussia & Saxony Saxony State Railways, 8cyl 200hp railcars, five # ?? Switzerland SBB, 8LV21 250hp, one # 9901 railcar. Tunisia Chemin de Fer du Tunisiens, 8LV21 250hp, one # 2-2 DE 2. Switzerland Appenzellar Bahn, railcar, 6LV22 250hp, two # 25 & 55. Manchuria South Manchuria Rly, 8LV31 750hp, one #2000. Switzerland SBB, 6cyl 420hp # 18601 luggage van. Argentina Port of Rosario, 6LV25 330hp shunter, three - # ?? Manchuria South Manchuria Rly, railcar 6LV22 250hp, two - #?? Thailand Royal State Railways of Siam, 8LV25 450hp, six # 501 - 506. United Kingdom Armstrong Whitworth/LNER, 6LV22 250hp railcar, three #?? Algeria Algerian Railways (CFA ex PLM), 8LV31 750hp, one # PLM 4-ADE-1. Argentina Buenos Aires Great Southern 2 x 8LV34, 850hp mobile powerhouse, three # UE 3 -5. Argentina Buenos Aires Great Southern 2 x 8LV34, 850hp locomotive, one # CM210. Ceylon Ceylon Government Railways, 880hp, two # ? ?, exported to Argentina. France PLM Rly of France, 8cyl 600hp, one # 4BMD1. France CF de Ceinture, 8LD28 800hp, one # D1. Morrocco CDF Mediterranee au Niger, 8LV28 600hp, one - #?? United Kingdom Armstrong Whitworth, 8LD28 800hp, one #?? Argentina Ferrocaril Oeste, 6LDA25 450hp rail-motor, one # ?? India North Western Railway, 2 x 8LD34 1,200hp each, two # 331/332. Manchuria South Manchuria Rly, articulated four car train, 6LTD25 500hp, 4 #?? India Bombay,Baroda & Central India Rly, 6LTD22 340hp, one # DE800. Algeria Comp. Phosphates de Constantine, 6LDA 735hp, two # 6-XADE-1 & 2, sold to CFT Tunisia in 1949. Argentina Argentina State Rly, railcar, 6LF19 300hp, four - #?? Argentina Argentina State Rly, articulated railcar, 6LF19 600hp, two - #?? France PLM Rly of France, 2 x 12LDA31 1,900hp each, one # 262 BD 1. Madagascar Chemin du Fer du Madagascar, 6LDA25 625hp, five # LD1 - 5 (delivered 1943 - 1946). France PLM Rly of France, 6LDA25 635hp, three # 4-DMD-1 to 3. Tunisia SNCFT, locomotive, 735hp, two - #?? Algeria SNCFA, railcar, 2x6LTD19 600hp total, 1#?? Brazil Estrada de Ferro Santos a Jundial, articulated railcar 6LDA25 600hp, 2, #?? Cuba Ferrocarriles Occidentales de Cuba, re-engined railcar 2x6LTD19 580hp total, 1, #?? Senegal Chemin de Fer Dakar au Niger, 6LDA25 610hp, six # BB101 - BB106. Algeria Algerian Railways (CFA ex PLM), 2 x 6LDA25 600hp, repowering of 1933 loco # 232-ADE-1 during 1940/41. Thailand Royal State Railways of Siam, 6LDA25 735hp, four # ?? (delivered 1945 - 1946). Algeria Algerian Railways (CFA), 6LDA19 400 hp railcar, total of 16 delivered 1947 - 1951. Mali Regie des CDF du Mali, 6LDA25 610hp, ten # BB107 - BB116 (delivered 1947 - 1951). Bolivia Patino Inc, FC Machacamarca - Uncia 6LDA28 730hp, two # 20 (deliv 1950) & 24 (deliv 1956). France SNCF, 6LDA22 510hp, 48 # 61001 - 61048 (delivered 1950 - 1953). France Paris Metro RATP, 6LDA22 600hp, 1 # T101 (delivered 1950). France Houilleres du Bassin de la Loire, 6LDA22 600hp, 1 # ?? (delivered 1950). Ireland CIE, 6LDA28 915hp, two # 1100 - 1101. Thailand Royal State Railways of Siam, 8LDA25 960hp, three # ?? (delivered 1950 - 1951). Tunisia Sfax - Gafsa Rly, 6LDA25 610hp, seventeen # 201 - 217. Argentina Argentina State Railways, 4 x 6LDA25 735hp each, 2 #?? Madagascar Chemin du Fer du Madagascar, 6LDA25 625hp, seven # LD6 - 12. France USINOR, Denain, 6LDA22 570hp, three #?? Guinea Conakry Niger Railway, 6LDA25? 625hp, two # ??. Madagascar Chemin du Fer du Madagascar, 6LDA25 675hp, two # LD11 - 12. Australia Commonwealth Railways, 6LDA28 955hp, fourteen # NSU 51 - 64 (delivered 1953 - 1954). France SNCF, 6LDA22 600hp, 19 # 63001 - 63019. France Electricite de France - Centrale Arrighi, 6LDA22 600hp, two # III? & IV . France Sollac, 6LDA22 600hp, five # ?? (delivered 1953 - 1954). Spain RENFE, 6LDA22A 350hp, 202 # 10301-10400, 11301-11400, 12301-12302 (delivered 1953 - 1966). Algeria Algerian Railways (CFA), 8LDA25 960hp, ten # 060-YDA- 1 to 10. Cuba Cuban National Railways, 6LDA22C 740hp, six #7501 - 7506. France SNCF, 6LDA22 600hp, 19 # 63020 - 63038. France Electricite de France - Nantes-Chevire, 6LDA22 600hp, one # ?? Japan Japan National Railways, 6LDA22 750hp, one, #?? Senegal Chemin de Fer du Senegal, 6LDA25 720hp, eight # BB221 - BB228. Sierra Leone Sierra Leone Dev Co., 6LDA28 850hp, six # 100 - 104 (1954) & 105 (1960). Spain RENFE, 6LDA22 600hp, 20 # 10501-10520. Switzerland Sulzer Brothers, 6LD22 350hp, one, #?? Cuba Cuban National Railways, 6LDA22C 740hp, six #??. France SNCF, 6LDA22B 600hp, 40 # 63039 - 63078. France SNCF, 12LDA28 2,000hp, 35 # 65501 - 65535 (delivered 1955 - 1959). France Sollac, 6LDA22 600hp, 1 #??. Germany Henschel & Son, 6LDA22 360hp, 1, #?? Switzerland Swiss Federal Railways, 2 x 6LDA25 850hp, four # 1501 - 1504. Ecuador ENFE 2 x 6LDA25 610hp, five # 151 - 155. France SNCF, 6LDA22C 600hp, 30 # 63079 - 63108. Morrocco CDF Mediterranee au Niger, 6LDA22 600hp, three - #?? France SNCF, 6LDA22C/D/E 720hp, 86 # 63109 - 63195 (delivered 1957 - 1958). Japan Japan National Railways, 8LDA25 1,200hp, 65 # DF50 01 - 65 (delivered 1957 - 1962). France CAFL Paris, 6LDA19 420hp, one #?? France Marine Homecourt, 6LDA19 420hp, one #?? United Kingdom British Railways, 6LDA28 1,160hp, 151 # 5000 - 5150 (delivered 1958 - 1961). United Kingdom British Railways, 6LDA28 1,160hp, 47 # 5300 - 5346 (delivered 1958 - 1959). France Sollac, 6LDA22B 600hp, 1 #??. Roumania Caile Ferate Romine (CFR), 12LDA28 2,100hp, 1,407 # 060 DA 001 - 1407 (delivered 1959 - 19xx). United Kingdom British Railways, 12LDA28 2,300hp, 10 # 1 - 10 (delivered 1959 - 1960). United Kingdom British Railways, 8LDA28 1,550hp, 98 # 6500 - 6597 (delivered 1959 - 1962). Switzerland Swiss Federal Railways, 2 x 6LDA25 850hp, ten # 1505 - 1514 (delivered 1960 - 1961). United Kingdom British Railways, 12LDA28B 2,500hp, 183 # 11- 193 (delivered 1960 - 1963). France SNCF, 8LVA24 1,750hp, two # 66501/502. United Kingdom British Railways, 6LDA28B 1,250hp, 25 #5151 - 5175 (delivered 1961 - 1962). United Kingdom British Railways, 6LDA28B 1,250hp, 69 #5347 - 5415 (delivered 1961 - 1962). United Kingdom BRCW, 12LDA28C 2,750hp, one # D0260. France SNCF, 6LDA22E 750hp, 55 # 63196 - 63250 (delivered 1962 - 1963). Nyasaland Nyasaland & Trans Zambesian Rly, 6LDA28B 1,200hp, five # 200 - 204. Peru Peruvian State Railways, 6LDA22E 510hp, two, #?? United Kingdom British Railways, 12LDA28C 2,750hp, 507 # 1100 - 1111, 1500 - 1701, 1707 - 1999 (delivered 1962 - 1967). France SNCF, 12LVA24 2,650hp, 81 # 68001 - 68081 (delivered 1963 - 1967). Nyasaland Nyasaland & Trans Zambesian Rly, 6LDA28B 1,200hp, three # 205 - 207. Spain RENFE, 6LDA22E 725hp, ten # 10701-10710. United Kingdom British Railways, 6LDA28 1,250hp, 302 # 5176 - 5299, 7500 - 7677 (delivered 1963 - 1967). Nigeria Nigerian Railway Corp. 6LDA28C 1,400hp, 29 # 1401 - 1429. Australia Commonwealth Railways, 6LDA28B 1,400hp, thirteen # NT 65 - 77 (delivered 1965 - 1968). Cuba Cuban National Railways, 12LVA24 2,534hp, ten #2501 - 2510. Poland Polish Railways (PKP), 12LDA28 2,100hp, 422 # ST43-001 to 422. United Kingdom British Railways, 12LVA24 2,650hp, five # 1702 - 1706. Bulgaria Bulgarian Railways (BDZ) 12LDA28 2,100hp, 130 # 06.001 - 06.130 (delivered 1966 - 1975). Nigeria Nigerian Railway Corp. 6LDA28C 1,400hp, four # 1425 - 1428. Roumania Caile Ferate Romine (CFR), 6LDA28B 1,250hp, 693 # 80, 81, 84, 88xxx series. Spain RENFE, 6LDA22B 400hp, 63 # 10401-10463 (delivered 1966 - 1977). Nyasaland Nyasaland & Trans Zambesian Rly, 6LDA28B 1,200hp, seven # 208 - 214. United Kingdom Hawker Siddeley, 16LVA24 4,000hp, one # HS4000. Roumania Caile Ferate Romine (CFR), 6LDA28B 1,250hp, 633 # ?? (delivered 1967 - 1992). Roumania Industrial, 6LDA28B 1,250hp, 476 # ?? (delivered 1967 - 1992). Malawi Malawi Railways, 6LDA28B 1,200hp, five # 405 - 409. Bulgaria Bulgarian Railways BDZ, 6LDA28B 1,250hp, 263 (delivered 1969 - 1992). China China Railways 12LDA28 2,100hp, 285 # ?? ND2 class (delivered 1971 - 1987). China Industrial ?? 6LDA28B 1,250hp, 2 # ?? Czechoslovakia Czech State Railways, 6LDA28B 1,250hp, 42 # ?? (delivered 1972 - 1983). United States of America Demonstrator, 6LDA28B 1,250hp, 1 # ?? Roumania Caile Ferate Romine (CFR), 6LDA28B 1,250hp, 28 # 69xxx & 73xxx series. United States of America** Southern Pacific, 8ASL25/30 2,800hp, four # 7030 - 7033. Poland Owner ? ?, 6LDSR28B 1,250hp, 2 # ?? Roumania Industrial, 6LDSR28B 1,250hp, 111 # ?? (delivered 1977 - 1987). United States of America** Morrison Knudsen, 6ASL25/30 1,500hp, one # 5001. Iraq Owner ? ?, 6LDSR28B 1,250hp, 10 # ?? (delivered 1979 - 1982). Roumania Caile Ferate Romine (CFR), 6LDSR28B 1,250hp, 28 # ?? (delivered 1979 - 1983). United States of America** ATSF, 16ASV25/30 3,600hp, four # 5496 - 5499. United States of America** Union Pacific, 16ASV25/30 3,600hp, six # 60 - 65. Mozambique CFM Mozambique, 6LDA28B 1,250hp, 32 # ?? (delivered 1980 - 1981). China China Railways 12LDA28 2,100hp, 88 # ?? ND3 class (delivered 1984 - 1990). Iraq Owner ? ?, 6LDA28B 1,250hp, 3 # ?? USSR Industrial 6LDA28B 1,250hp, 1 # ?? **The USA units were remanufactured using existing/withdrawn bodies, bogies and other components. The following is a narrative describing (hopefully) the roots of the Sulzer engines in the UK that led to the introduction of the Class 24. An advertisement from 1963 depicting the Brush Type 4, powered by the Sulzer 12LDA28C engine. The firm of Sulzer Brothers was founded in 1834 comprised of the father, Johann Jakob Sulzer-Neuffert and his two sons, Johann Jakob & Salomon. The building of a foundry in Winterthur, also in 1834 led to the beginnings of the production of numerous items including iron castings, heating radiators, steam boilers and stationary steam engines. Expansion took place into pumps, fans, paddle steamers and refridgeration equipment. The production of ice making machines for Professor Carle von Linde brought the firm into contact with Rudolf Diesel, a student under Professor Linde. Diesel had arrived at Winterthur in 1879 under the recommendation of Linde, to gain some practical engineering experience whilst waiting to re-sit his exams, missed in 1879 due to a bout of typhoid fever. In February 1892 Diesel applied for his famous Patent that heralded the birth of the diesel engine, although at this time it was little more than ideas & hypotheses. Initially he received little support for development of his patent, in widening his search for interested parties he forwarded a copy of his book to Sulzer Brothers, also personally corresponding with their chief engineer, Wilhem Zublin. The response from Sulzer was lukewarm, even Sulzer's prinicipal advocate Johann Jakob Sulzer-Imhoof remained interested but cautious. They, like many others were interested in the scientific aspects but seemed wary of the commercial prospects for this new technology. However an agreement was signed in May 1893 with Diesel to allow Sulzer Brothers exclusive rights of Diesel's patents in Switzerland and to receive all discoveries from the research carried out by Diesel at Augsburg. 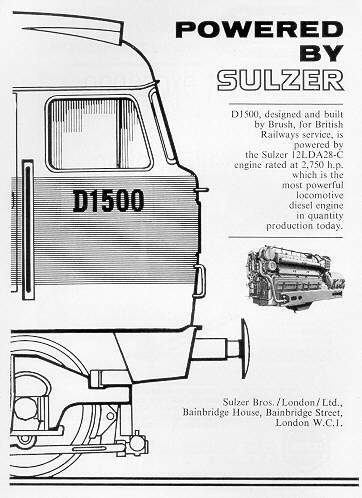 Sulzer Brothers were one of ten licensees signed to Diesel's patents. Diesel's initial machine was completed in July 1893, but took a further seven months to reach an acceptable level of operation. J.J. Sulzer-Imhoof visited Augsburg several times, in November 1895 to see Diesel's original engine and then in February 1897 to witness successful demonstrations of a second engine. The thermal efficiency of this engine was greater than double that of current steam engines, a fact which led to Sulzer (and many of the other licencees) to build and test its own diesel engines. This resulted in the succesful running of their first engine during June 1898, a single cylinder four stroke engine developing 20bhp. In 1898 a holding company, the Allgemeine Gesellschaft fur Dieselmotoren AG was established to handle all rights to Diesel's patents. All licencees provided the holding company with data obtained from research into this new technology. Many pitfalls were encountered and Sulzer Brothers were also encumbered with the 1893 agreement that seriously limited the markets open to them. A new, broader licensing agreement drawn up in 1903 provided them with the impetus to create a diesel engine department, a research area for the two & four stroke designs and a sales department. Winterthur's first order came in January 1903 for twelve 35hp single cylinder engines. The journey had begun. By 1906 twelve engine sizes were available, with outputs from 15 to 600 bhp. Although the commercial success of the diesel engine was now assured, its chief creater, Rudolf Diesel suffered a series of financial set backs as well as falling into poor health. On September 29th 1913 Diesel and two colleagues boarded a steamer bound from Antwerp to Harwich. He was not seen alive again, a body carrying his identification was later found by a Dutch vessel, and in line with tradition at the time the remains were buried at sea. Sulzer's use of worldwide licencees to build their engines was a remarkable pioneering business decision which over time proved to be the correct one considering the location of Winterthur. The first licencee in the UK was William Denny & Brothers of Dumbarton in February 1913, followed by Sir W G Armstrong Whitworth Co Ltd, Newcastle upon Tyne in March 1920. The initial direction of Sulzer's new found diesel engine production was for stationary applications, the 'D' & 'K' models. However the fitting of the French canal barge 'Petit Pierre' late in 1903 with AB Diesels Motorer 25hp diesel engine saw the first successful marine application. Sulzer's first application 'at sea' was in a Leeds - Liverpool canal boat in 1905 with a two cylinder thirty horsepower 'D' series engine. The application was not a success, but as usual the experience was priceless. And so it would be through to the end of the 20th Century, when their 12RTA96C, at the time the world's most powerful diesel, and delivering just under 90,000hp entered service in some P&O vessels. For the railway application Sulzer built rail traction engines between 1912 & 1992. Their first attempt, like the English canal boat was not a success. The 1912 built 'Thermo-Lokomotive' containing a four cylinder two stroke 1,000hp diesel engine (a 4LV38) was a failure, the unusual starting procedure and the direct transmission proving to be major weakness in the design. Two years later five railcars for the Prussian & Saxony railways proved to be the better starting point for rail traction, fitted with faster running four stroke engines (6LV26's) and coupled to an electric transmission. In the United Kingdom the firm of Armstrong Whitworth of Scotswood, Newcastle established a diesel traction department in 1930/31, employing use of the Sulzer line of engines. Three Sulzer powered 250bhp LNER railcars were manufactured in 1932 for the Tyneside area. In 1934, the LMS ordered a diesel electric shunting locomotive (7408, later 7058) powered by a six cylinder Sulzer engine (6LV22), with electrical components from Lawrence Scott and Electromotors of Norwich. This was based on an earlier 1932 built machine destined for industrial service and which would outlive the LMS shunter. It trialled at Willesden and Crewe, and clearly showed its superiority over the diesel mechanical types. The advent of WW2 saw it borrowed by the War Department between 1941 - 1943, returning afterwards to Willesden. Its final years were spent at Toton, being allocated BR number 13000, but never carried as its service ended in November 1949, being scrapped two months later at Derby Works. By 1935 an order for twenty shunters, based loosely on 7058 and 7079 (the E.E. variant) was issued by the LMS. Ten were delivered by Armstrong Whitworth late in 1936, numbered 7059 - 7068, using the same Sulzer engine as 7058, a 6LTD22 model, now rated at 400hp. This increase was achieved by lightening the components and increasing the rpm from 775 to 875. The main generator and traction motor being supplied by Crompton Parkinson. The jackshaft drive was continued over from 7058, but the main fuel tank was now placed between the cab and the engine compartment. All entered service in 1936 split between Crewe South and Kingmoor. Starting in 1940 they were all requisitioned by the War Department, seeing service in France, Belgium, Holland and Egypt. Four were eventually purchased by the Belgian Railways, the last not being retired until January 1966. Two were sold to the Egyptian State Railways in the early 1950's, remaining in service until 1974. Two suffered mechanical problems and saw no service after the war's end whilst the remaining two saw much use by the War Department in the UK before being sold to private buyers. Prior to World War Two Armstrong Whitworth closed down its diesel traction department. 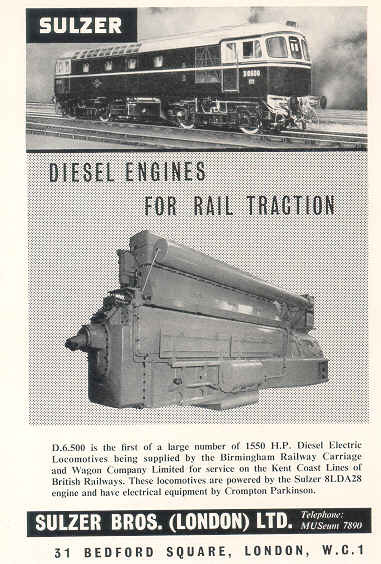 A 1960 advert portraying the BRCW Type 3 destined for the Southern Region, and the engine it was equipped with. The 'LD' series of engines came into production in 1933 with Armstrong Whitworth's prototype 'UL' locomotive in the UK and other pioneering locomotives built in France. Gradually the 'LD' series would become Sulzer's primary offering for traction needs. During the 1930's thirty countries operated Sulzer powered rail vehicles whilst by 1937 a single engine producing in excess of 2,000hp was available. This culminated in the twin bank 12LDA31 from 1937/38, used in double locomotives built for use in France & Roumania. The nomenclature of the engine designations was, for example, 6=cylinders, L=traction i.e. locomotive, D= direct injection, A=blown/turbo charged (from the German 'Abgasturbine'), 28=cylinder bore in centimeters. The 'LD' series engines first appeared in the British Isles in mainline Sulzer powered locomotives built in 1951 at Inchicore for the CIE. They were 80ton Bo-Bo's of 915hp (later 960hp), numbered 1100/1 powered by a 6LDA28 engine at 750rpm, with Metropolitan Vickers electrical equipment. During 1954/55 BRCW, Sulzer and Crompton Parkinson produced twenty machines for Commonwealth Railways (14) and the Sierra Leone Development Corp. (6), using the 6LDA28 of 900/1000hp. During 1956/7 the CIE ordered 12 A1A A1A machines, again Metropolitan Vickers supplied the electrical equipment, but assembly was by BRCW. With this last order however the diesel engines were constructed at Vickers Armstrong's plant at Barrow in Furness, rather than at Sulzer's Winterthur plant. By the time of the first BR/Sulzer Type 2 order Sulzer were firmly established with a product that could be bought 'of the shelf'. With a British Transport Commission requirement mandating orders to go to English firms, the Sulzer engines were built under license by Vickers Armstrong at Barrow, who at that time were enlarging their workshops to handle a production run of about 1,450 power units. During the height of production 12 - 15 engines were turned out each month. This number included about sixty spare power plants. To allow Vickers Armstrong time to tool up Sulzer supplied the first ten 6LDA28A engines from their plant at Winterthur.